Build constellations and catch shooting stars with this puzzle-like geometry game. When everything goes juuust right, it's said that the stars must be aligned. But, sometimes you just gotta put 'em in order yourself. Practice positioning those twinkling beauties with this far out game. Part puzzle and part chance, it's a geometry lesson in disguise. 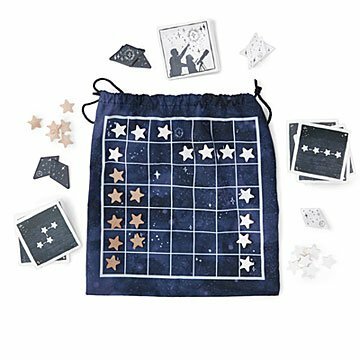 By drawing "constellation" cards and placing colored stars on the board (cleverly printed on a sack that keeps everything in one place) players recreate shapes to earn "shooting stars." Collect five to blast-off for planet Win. Made in China.